Name any four components of pneumatic system. What are the factors considered while selecting them ? Draw labelled sketch of air lubricator. Explain pressure relief valve in pneumatic system. The pressure relief valves are used to protect the system components from excessive pressure. Its primary function is to limit the system pressure within a specified range. It is normally a closed type and it opens when the pressure exceeds a specified maximum value by diverting pump flow back to the tank. 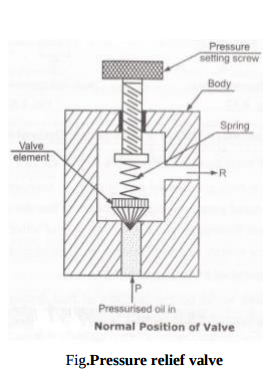 The simplest type valve contains a poppet held in a seat against the spring force as shown in Figure. This type of valves has two ports; one of which is connected to the pump and another is connected to the tank. The fluid enters from the opposite side of the poppet. 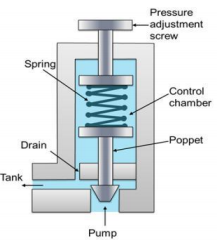 When the system pressure exceeds the preset value, the poppet lifts and the fluid is escaped through the orifice to the storage tank directly. It reduces the system pressure and as the pressure reduces to the set limit again the valve closes. State any four reasons of failure of pneumatic seals. (c) What are the advantages of pneumatic system over hydraulic systems ? List various types of air motors. 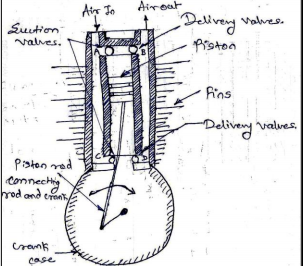 Explain vane type air motor with neat sketch. Various Types of Air Motors 1. Vane Motor 2. Gerotor Motor 3. Turbine Motor 4. Piston Motor Construction: It consists of simple Vane rotor which is having slots in which vanes (flat piece of steel) slides freely. The rotor is eccentrically located inside the stator housing. Working: When pressurized air comes in through inlet port, the pressure of air distributes equal in all directions. Since vane is sliding freely in slots of rotator, the vane comes in to way of pressurized air and air pushes the vanes so that rotor starts rotating with speed. The used low pressure air is exhausted through exhaust port. This is unidirectional motor. Since vanes are freely sliding in slots, there is possibility of leakage of air. With the help of these motors we can achieve the speeds up to 25000 r.p.m. What is FRL ? State the function of each component of FRL. FRL Unit: It is service unit used in Pneumatic system which is combination of three devices named as Filter, Regulator and Lubricator. Function of FRL unit Filter (F) – 1) To remove the micron and sub-micron particles present in the entering air of compressor. It is Used to separate out contaminants like dust, dirt p[articles from the compressed air Regulator (R) – In pneumatic system the pressure of compressed air may not stable due to possibility of line fluctuation. Hence there is a need to maintain and regulate the air pressure. This function is performing by regulator. Lubricator (L) – Sliding components like spool, a pneumatic cylinder has sliding motion between parts. It may cause friction and wear and tear at mating parts. To reduce friction, lubricating oil particles are added in the compressed air with the help of lubricator. List any four applications of pneumatic rotary actuator. 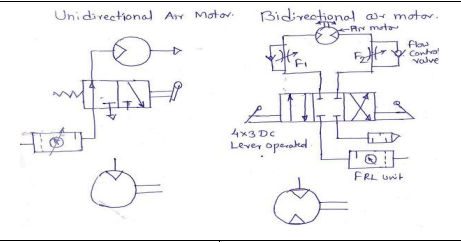 Draw the symbol for variable speed bidirectional air motor. Explain time delay valve with neat sketch. Time delay valve is a combination valve used to set the operation time as per the requirement. The time delay can be increased or decreased by adjusting the flow through the non-return flow control valve. The change invariably increases or decreases the time taken to fill and pilot actuates the direction control valve. Time delay valve is a combination of a pneumatically actuated 3/2 direction control valve, an air reservoir and a throttle relief valve. The time delay function is obtained by controlling the air flow rate to or from the reservoir by using the throttle valve. Adjustment of throttle valve permits fine control of time delay between minimum and maximum times. In pneumatic time delay valves, typical time delays in the range 5-30 seconds are possible. Draw speed control pneumatic circuit for bi-directional air motor. Fig. 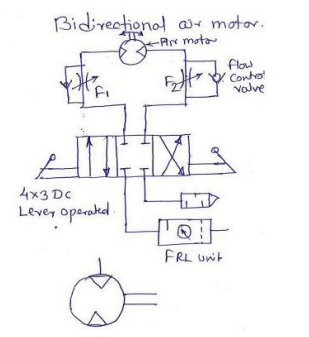 Speed control of bi-directional air motor Bi-directional air motor rotates in clockwise as well as anti-clockwise direction. The speed of bidirectional motor is controlled as shown in fig. The speed control of motor by using variable two flow control valves having built-in check valve and 4x3 DC valve having zero position or central hold position with lever L1 and L2. When lever L1 is operated, port P will be connected to port A of air motor and motor will start rotating in clockwise direction. Its speed can be controlled by using variable flow control valve F1. Port B of motor will be connected to exhaust R and air in motor will be exhausted through port R via DC valve. When lever L2 is operated, pressure port P will be connected to port B of motor and naturally motor will start rotating in anticlockwise direction. Port A will be connected to port R and air in the motor will be exhausted through port R via DC valve. List different types of pressure regulator valves ? Explain any one with neat sketch. Pressure-relief valve.Pressure-reducing valve. Unloading valve Counterbalance valve Pressure-sequence valve Brake valve. Working: The compressed air pressure from FRL unit acts against the poppet (valve element) through inlet of pressure relief valve. When the force of air is greater than the spring force then poppet gets lifted from the valve seat and valve opens. Thus the excessive pressurized air will get release to the atmosphere through port R. (03 marks) OR Pressure regulation in pneumatics is vital for the correct operation of circuits and for damage prevention to circuit components. 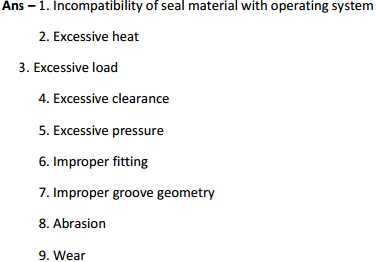 As you would imagine all pneumatic components have a maximum operating pressure. Types: A) According to no. of stages Single stage and two stage regulator B) According to pressure relief Non- relieving type and relieving type pressure regulator Non-relieving pressure regulator Non-relieving pressure regulators work by restricting flow rather then venting it should over pressure occur. 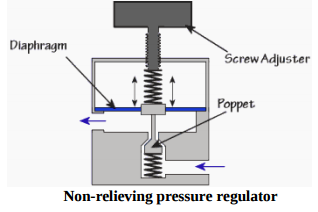 The regulator restricts flow when the pressure gets too high because the pressure acts on the diaphragm forcing i t up against the spring pressure, the diaphragm has what is called a ‘poppet’ attached on the end of it which is drawn up with the diaphragm and restricts the passing air flow. 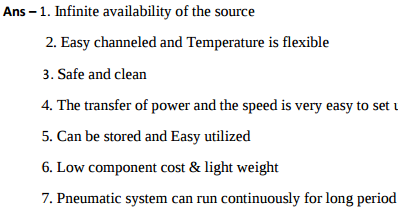 State at least four advantages and disadvantages of pneumatic systems. Advantages of Pneumatic system 1) Infinite availability of the source 2) Easy channeled and Temperature is flexible 3) Safe and clean 4) The transfer of power and the speed is very easy to set up 5) Can be stored and Easy utilized Disadvantages of Pneumatic system ( Four points 02 Marks) 1) Requires installation of air-producing equipment 2) Easy to leak 3) Potential noise 4) Easy condenses 5) Low operating pressure 6) Limited applications. 1) Air inlet filter – Free air from the atmosphere enters the compressor through an air-inlet filter which will essentially keep out the dust and dirt from entering the system. 2) Compressor: It is used to compress the air from atmosphere pressure to the desired higher pressure level. It can be single stage or multistage in operation. 3) Cooler: Removes the heat generated during the process of operation. 4) Pressure switch and control unit: Maintains the pressure in the receiver in the predetermined range by starting and stopping the prime mover. 5) Moisture separator: Cooling air in the cooler results in condensation of vapor in the air. The condensate in the form of water droplets are separated from air. 6) Service unit: Filter – Separates sub-micron level contamination. Regulator – Bring the pressure of air from receiver pressure to the device pressure. Lubricator – Adds lubricants to air. 7) Pipe Line: They carry the compressed air from one location to another. 8) Control Valves: They are required to control the air direction, pressure and flow rate. They are responsible for the smooth and precise control of the pneumatic actuator, and also for the safe operation of the system. 9) Actuator: They will convert the high pressure energy of the compressed air into mechanical force or do useful work. Actuators can either be pneumatic cylinders to provide linear motion or pneumatic motors to provide rotary motion. Double acting reciprocating air compressor is similar to double acting reciprocating pump. It is comprised of following parts: 1) Cylinder 2) Piston and piston rod and connecting rod. 3) Crank and crank case 4) Two suction valves and two delivery valves. 5) One inlet port and one outlet port It uses four bar mechanism. There are 4 valves (2 suction valves and 2 delivery valves) shown at A, B, C, D in figure. There are cooling fans similar to single acting compressors. The crank rotates on electric motor/engine/turbine. In this compressor, compression of air takes place on both side of the piston. 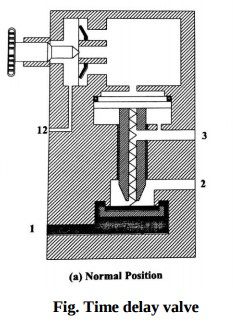 When crank rotates, the piston starts reciprocating. When piston comes down and attains, ‘Bottom dead center piston’ the air comes in through port ‘A’ due to vacuum created due to downward movement. When piston starts moving upward, the air starts compressing. When piston attains, ‘Top dead center piston’, the stroke is complete and air is fully compressed which goes out through delivery valve ‘B’ to air receiver. During this upward movement the vacuum is created on other side (Piston rod side) of piston. Suction valve ‘C’ opens and air comes in. 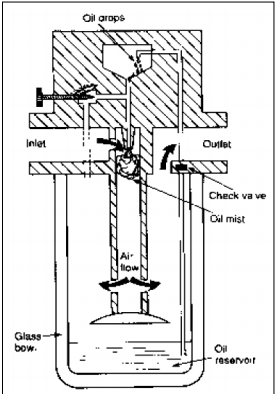 When piston starting comes down, this air which came through valve ‘C’, gets compressed and compressed air goes out through delivery valve ‘D’ to air receiver. In this downward movement air comes in through valve ‘A’ and entire cycle repeats. Compare linear actuators and rotary actuators. 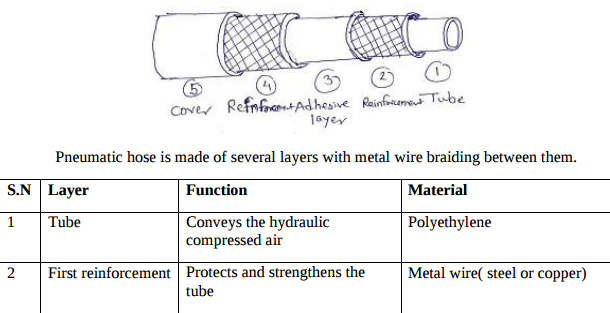 Draw constructional details of pneumatic hose. Why hose is required in pneumatic circuits?